I am a swimmer. Every morning, weather permitting, I get on my bike, peddle across the peninsula, and swim at the Portland Y. I always assumed I’d end up in a pool, having torn, twisted and generally f”-ed up everything a guy can f-up: shoulders, hip, back, hands. (The knees are in good shape, surprise.) The pool is the refuge of the aged-maimed athlete. My swim is good. I can’t hurt myself. It’s also good for my head. It can be a meditation or a lesson in tedium, both of which are beneficial and have intrinsic value. Today was different. I wanted it over. I wanted to return home, to my chair, and finish a book, specifically, Infinite Jest by David Foster Wallace. I’ve been working on this book for two and half months. It’s a three-pound book, three pounds and two ounces precisely. One thousand twenty-seven pages, including footnotes. It’s a monster and I had only twenty pages left. The sprint to the finish. Get the swim over. Finish it. But more. I love this book. Two and half months living with it, studying it, reading the footnotes and the on-line commentary. It was in my blood, under my fingernails, and with only an hour or so left with it, like it was a lover going off to war, I wanted its company–its company until the last. Period. In fact, finishing it was the most remote of my motives. Make it last. That’s the ticket. This so-called culture is a theme and subject of Infinite Jest. (There are ever so many themes to IJ.) Culture has been sold off. Corporate America bought it and ate it for lunch between two pieces of Wonderbread. It has an appetite that knows no satiation. See this picture? 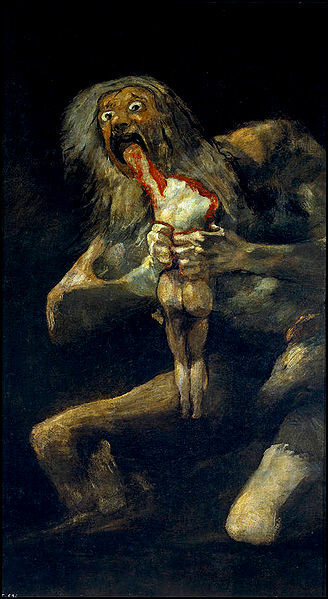 It’s Saturn Devouring His son by Goya: Corporate America consuming the individual–that’s how I read it. It is the apex of irony (should irony be a bell curve) that a country founded, built, and realized on/of individualism–a political and historical anomaly–is and has been rushing hellbent to a state of homogenization. Reading a physical book, procured at your local establishment of reading pleasure, shifts the universe homeward, back to you. Go local. The less inviting option is to be devoured like Saturn’s son. Read. It transports. And so much more. It makes one think.